Gorgeous graphics will draw your students into each short, non-fiction reading passage. The coded text, showing every word separated into sound pictures, will render the nature of the English written Code transparent and make it possible for many students to read who might not otherwise be able to. 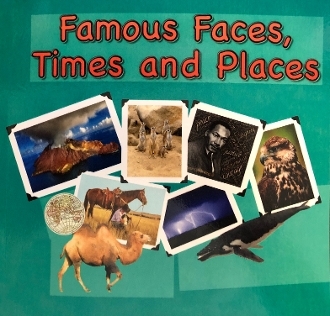 Famous Faces, Times and Places is the first reader in the new Phono-Graphix storybook series of the same name. It is comprised of excerpts from the other books in the series, allowing students to find and follow their interests. This series is targetted to remedial/intervention students (late elementary and older) working on multisyllable management, but can be used with any student using the 'Buddy Reading' techniques described in the Phono-Graphix instruction manuals.